Constructing Bridge 55D3095E1020003 on Grand Boulevard in Oklahoma City in 1911. The structure was part of an early effort to expand and beautify the city's park system. 1911	Oklahoma	55D3095E1020003	  Oklahoma Br. 1916	Tulsa		72-No Number	  Missouri Valley Br. 1918	Grady		26E1330N2890002	  Topeka Br. 1923	Washington	74E0188N3950005	  Kansas City Br. 1932	Tulsa		72E0600N3960002	  Rucks-Brandt Co.
1934	Adair		0102 1232 X	  Gaines Bros.
By the early 1900s bridge engineers were coming to realize the value of concrete as a building material for highway bridges. Concrete's strength in bearing the compressive weight of loads had long been established, but during the late nineteenth and early twentieth centuries efforts to give it another property, the ability to stretch, known as tensile strength, succeeded when reinforced concrete was developed. Inventors patented a number of ways to accomplish this, with bent or twisted steel bars eventually becoming the prefered technique. Since the shape of the rebar affected how the metal bonded with the concrete various designs appeared on the market. Technical change and improvements of this sort made their way into bridge building where promoters advertised their structures as alternatives to steel trusses, claiming as advantages longer life, simplicity in design, greater reliability, and lower maintenance. A main point was that concrete did not rust and never required painting. The first reinforced concrete bridge was built in San Francisco park in 1889 and proved a major success. Concrete arch bridges, however, also presented some problems. They required a fair amount of work on the site, including erecting falsework and making molds, needed transportation to move bulky materials, and demanded careful consideration of the bearing quality of the soil for laying foundations. These reasons, along with others, such as a shortage of skilled workers, the unsuitability of arches on streams with low banks, and even an unwillingness to break with the proven dependability of steel trusses, accounted for Oklahoma making less use of this type than appears to be true in many other parts of the United States between 1900 and 1930. A bad experiance with the first major federal aid project may have hurt concrete in the minds of engineers within the state road department. Plans for this bridge, a multi-span concrete arch across the South Canadian River near Oklahoma City, had to be scrapped when the contractor fled the state after failing to design acceptable foundations for the structure. As with all concrete arches, if the foundations are not secure, the structures can sink, develop cracks, and ultimately collapse. 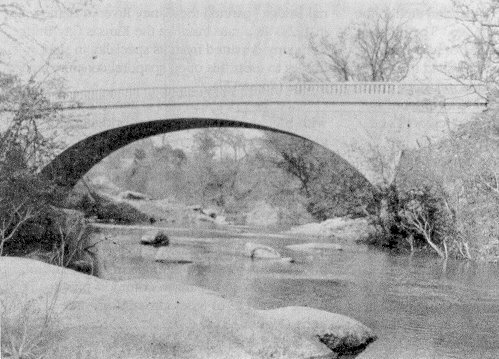 The concrete arch had its greatest utility in Oklahoma for culverts and small spans; of bridges surviving of this type, nearly 80% are 40-foot or less. Although historical records do not shed much light on this group of bridges, it seems clear that virtually all were built by local contractors. Since few localities had standards for construction at that time, these spans often reveal inferior workmanship, slight attention to detail, and inferior materials which have contributed to their presently poor condition, with cracking and spalling being a common problem. Fortunately some fine examples remain in Oklahoma that reflect both the standard, functionsl, and unadorned arches as well as ones with more architectural and decorative touches. The patented designs of Daniel Luten, an engineer and prolific builder of concrete spans throughout the country, were licensed to several companies, among them the Topeka Bridge and Iron Company that contracted with some Oklahoma counties. 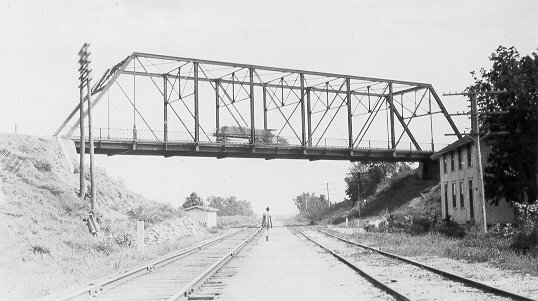 In 1918 this company put together an 88-foot bridge outside of Chickasha, its arch narrower than the deck, serving thus as an arched girder, and its plain parapet having incised rectangular panels. Both features are consistant with Luten designs (Figure 33). Figure 75. A historical view of bridge 35E1916N3550001 that spans Pennington Creek in Tishomingo, once the capitol of the Chickasaw Nation. Figure 76. Closed to traffic today, the 11th Street Bridge in Tulsa awaits a decision about its future on the Arkansas River. The more decorative possibilities of concrete appear in the Grand Boulevard bridge built in 1911 by the Oklahoma City Board of Park Commissioners as part of an innovative effort to link together a sprawling park system on the northern and eastern sides of the community. Tapered pilasters set off the three semicircular arches--the center one to convey Deep Fork and those on the banks intended for carriages--and a classical design is used on the railing (Figure 74). The presence of hard granite for a foundation permitted the state in 1924 to build a 100-foot long, closed spandrel arch in the old Chickasaw capital of Tishomingo. The builder Ernest S. Alderman, private contractor and sometime engineer with the state, embellished this structure with a classical balustrade, pilasters, and a projecting arch ring. The highway department's pride in this bridge was shown by references and photographs in official reports (Figure 75). When designing bigger bridges engineers could reduce the dead load of the structure by opening the spandrel walls, which also had an aesthetic effect in producing a more graceful profile. Tulsa intended to establish a civic landmark when it chose the Missouri Valley Bridge and Iron Company, a firm known for its skill in setting subaqueous foundations, to construct the 11th Street Bridge across the Arkansas River in 1916, making it the first monumental bridge in the state. Impressive in its eighteen spans, length of 1,400 feet, and open spandrel design, it underwent renovation during the 1930s when the Works Progress Administration widened the roadway, removed its railings and ornamental light posts, and covered over a sunken center lane used for streetcars. The increasing volume of traffic over the span, due to it becoming part of busy U. S. Route 66, brought about these renovations. At the same time, this new duty in carrying Route 66 gave the structure another historical dimension (Figure 76). Similarly perceived as a major municipal asset, though built on a much samller scale, the Washington County Memorial Bridge spanned the Caney River at Bartlesville in 1923. 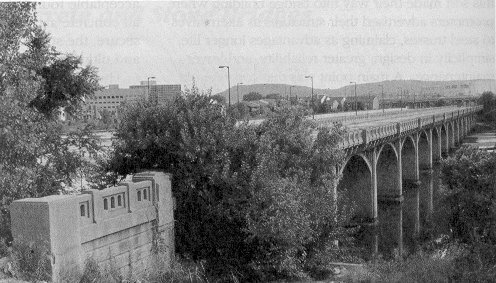 In a rare instance the Kansas City Bridge Company departed from its speciality in steel trusses to erect this open spandrel concrete arch bridge (Figure 77). Since the open spandrel is generally associated with bigger, more prominent bridges with greater visibility, when the design is put to use on more utilitarian structures, the bridge aquires greater historical interest. During a nationwide campaign in the 1930s to remove dangerous railroad crossings, the state cooperated with the Kansas City Southern Railway to build a concrete arch overpass near Stilwell. 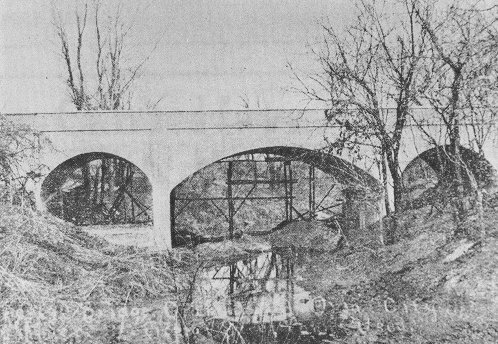 This 100-foot bridge, with arched openings in the spandrel, contrasted with the more common practice of using concretee or steel girders for grade separations (Figure 38).